Elation after Tess Csejka’s game-winning goal. It was 39 years ago after the Olympic Men’s Hockey Game between the underdog USA team and the mighty, unbeatable Russians when sports announcer Al Michaels shouted out “Do You Believe In Miracles? 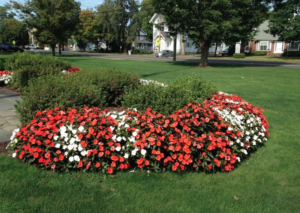 YES!” — a fact that wasn’t lost on Blade’s Coach John Peschell. 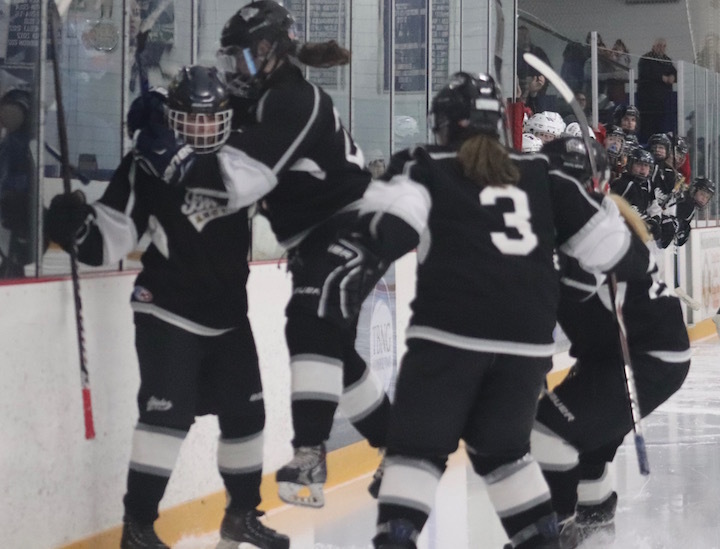 The Blades (Amity/Cheshire/North Haven) Girls Ice Hockey team went up against one of the toughest opponents in the SCC tournament final in West Haven on Friday night. Sacred Heart West Haven (18-2), which defeated the Blades 5-1 in late January may have crushed the confidence of some challengers, but Peschell’s girls didn’t let it phase them. They came into the game knowing that after a spotty season, they were blessed to be there and with unprecedented determination, they were ready to fight for the title. The Sharks’ Jenna Hunt started off the game with a goal in the first 26 seconds of the first period. Less than three minutes later the Blades’ Tess Csejka, tied the game, assisted by Haley Cable. The non-stop action in this matchup was unbelievable with everyone showing off their best moves. The clock ticked down and suddenly, with just 4 seconds remaining in the first, Megan Froehlich got one past Blades Goalie Caitlin Ranciato, taking the lead. The second period mirrored the first as far as hard work on both sides. This time the Blades were first to score, with Hannah Sosensky tying the game, assisted by Caroline Cadeina at 3:19. Then, at 9:28 Taylor Nowak scored for the Sharks, assisted by McNabola. The battle continues into the third period with the Sharks skating, shooting and passing like the champs they’d become. Two-thirds of the period passed without any change on the scoreboard. 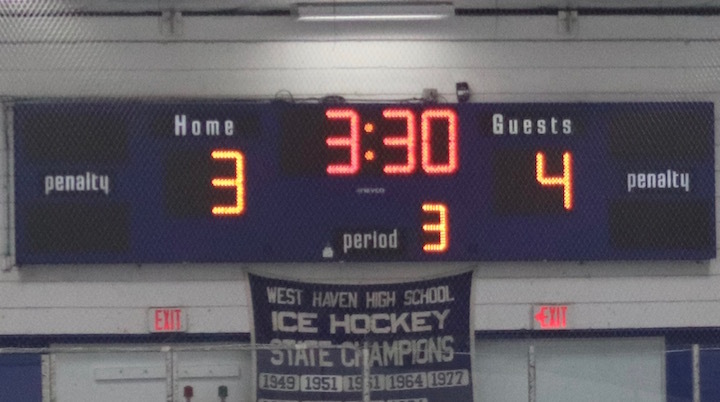 Then Tess Csejka swooped in on West Haven’s Goalie Kyleen Crowe and scored on a power play, assisted by Meaghan Hogan, tying the score at 3. Both teams continued to skate and shoot on goal until the Blades took possession and Csejka took a pass from Hogan and effortlessly slapped it into the net, getting a hat trick on the game-winning goal with 3:30 remaining. The buzzer sounded and Blades fans hoped to hear the announcer say, “Do You Believe In Miracles? YES!” because we sure did. Blades Win 4-3 and earn the title of SCC Champions. Csejka won the MVP award. The Blades out-shot the Sharks. Aside from the underdogs defeating a goliath team, there’s one more parallel to the 1980 Olympic “Miracle,” — both the USA and the Blades won 4-3. 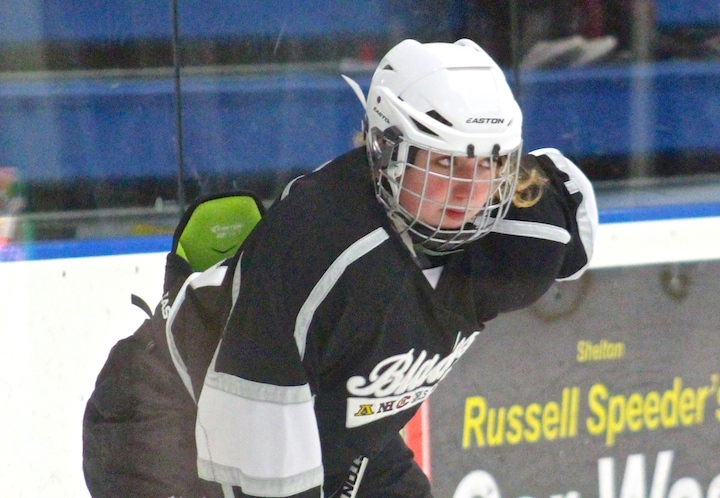 2018-19 Blades Girls’ Ice Hockey team is what some may call a “young” team. There are only six seniors on the roster: Caitlin Ranciato #1, Andrea Delvacchio #3, Shannon Reilly #12, Hannah Sosensky #12, (two #12s? It’s on the CIAC site) Meaghan Hogan #22, and Katie St. Peter #24. The four juniors all have familiar names: Tess Csejka #2, Sara Cable #4, Nadia DiNatale #11, Haley Cable #28. There are four sophomores: Megan Crowley #7, Olivea Kosh #8, Caroline Cadelina #14, and Kelsey McCarthy #16. Five freshmen round out the team: Ilana Leyner #10, Jade Krukar #15, Paige Kergaravant # 19, Mia Dow #20, and Carsyn Rizzuti #25. In past years, the Blades have been nearly unstoppable, losses were few and far between, but this year’s girls can’t seem to catch a break. At least 10 of the girls have played together and called Shelton their home ice, but this year, “home” is a rink in Hamden. The girls play hard and their experienced coach, John Peschell knows how to get the most out of his players. He believes in them, and we hope to see a more positive outcome in upcoming games. Come on Blades, you can do it! The Amity/North Haven/ Cheshire coop team (known as the Blades) played a scrimmage game against Hall/Conard at Veterans Rink in West Hartford on Wednesday, Dec. 5. We’ve come to know the Blades as nearly unbeatable in past years, but new season, new team, you can never tell how things will go. Last night wasn’t their night, they lost to Hall/Conard 5-2. The good news is that as a scrimmage, it doesn’t reflect on their season record either, and these girls have a long way to go until the end of the season. There are several familiar names still on the roster too. Here’s how the game went last night. Hall/Conard’s Nikki Herz scored the first goal off an assist from Luci Alissi. Our Blades’ Andrea DelVecchio tied the game off an assist from Shannon Reilly. HC’s Maya Borden made an unassisted goal. Then, Abby Goncalves scored, assisted by Gracie Cho. 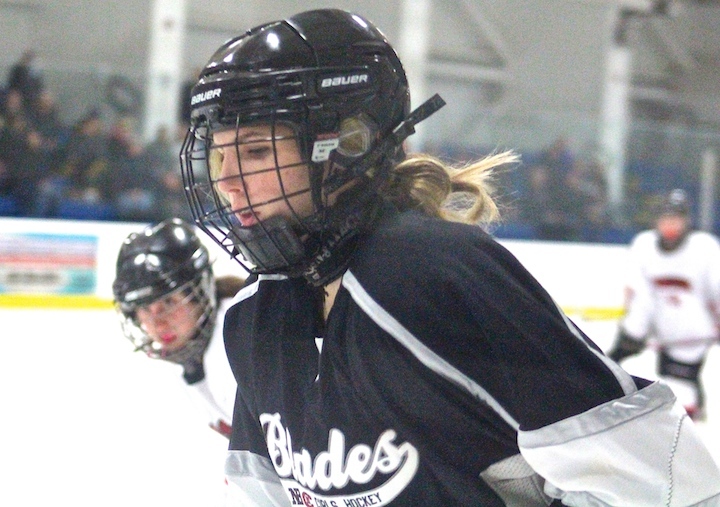 Out of the gate, the Blades’ Meaghan Hogan scored on an assist from Tess Csejka. HC forged ahead with an unassisted goal by Liv Fernandez, followed by the winning goal by Claire Ittleson, assisted by Nikki Herz. The Blades (Amity/Cheshire/North Haven) Girls Ice Hockey team hosted the Simsbury Trojans in Shelton on Saturday. It was Senior Night, which is always special for the girls who will be graduating this year. So another win for the home team would have been the icing on the cake. 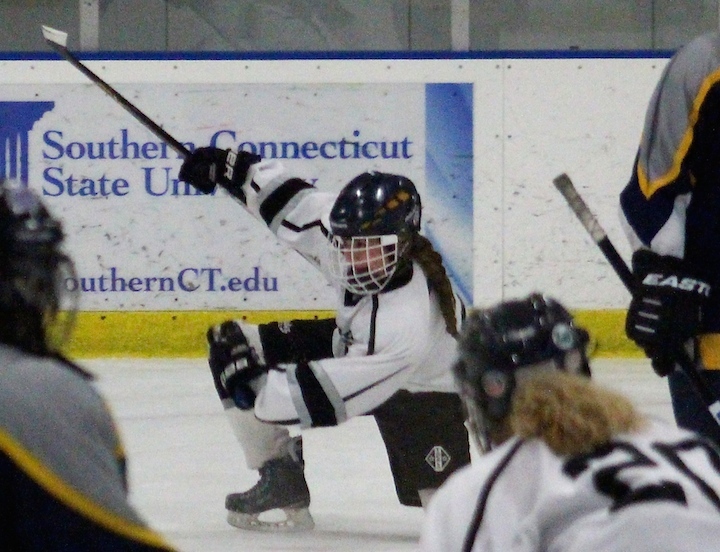 But Simsbury’s Grace Melanson (#22) had her own plans. 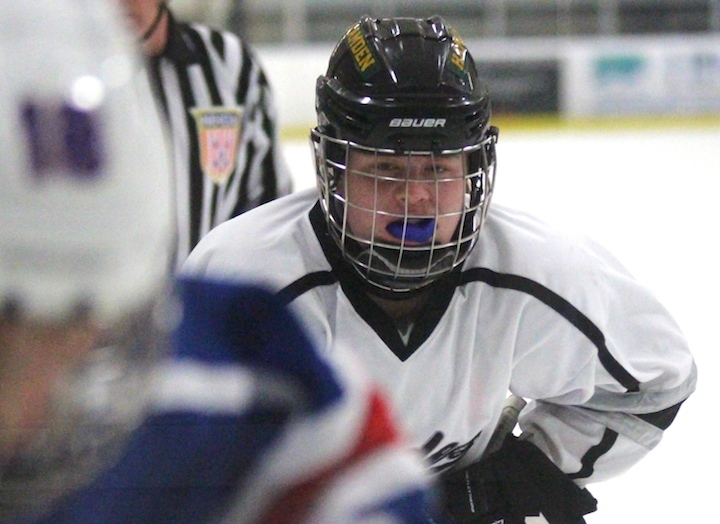 Melanson not only had a hat trick (3 goals in one game) but exceeded it with an additional two. Five goals in one game is incredible, and three of them were unassisted. NOTE: This is truly an amazing feat, The list of NHL players who’ve accomplished 5 or more goals in one game fits on one page. The majority are Canadian, but from what I could find one American, Mark Pavelich (Retired) of the New York Rangers did it on February 23, 1983. At 11:30 Melanson put the Trojans on the scoreboard assisted by Stephanie Rurka. At 7:21 the Blades’ Tess Csejka tied the game assisted by Meghan Hogan. The Blades pulled ahead with Haley Cable’s unassisted goal at 2:48. That looked good for the home team until Simsbury’s Kate Werle smacked one in with just 1 second remaining as the buzzer sounded. Everyone held their breath for a few minutes to see if the point counted. and – it – did. Score: 2-2. The second period belonged to Melanson who scored two unassisted goals for Simsbury, one at 10:28 and the second at 8:30. Score 4-2 Simsbury. Simsbury came out strong in the third period with Melanson again being first to score, this time within the first 5 minutes, she was assisted by Kaley Melanson and Elise Hildebrandt. Meghan Hogan (coincidentally also #22) scored for the Blades unassisted at 5:30. Then, it was Melanson’s turn again, scoring her fifth goal for the Trojans at 4:51. One minute later, her teammate Claire Bettor made a goal. Wrapping things up, Melissa Montesi shot one in for the Blades with 3:15 remaining. 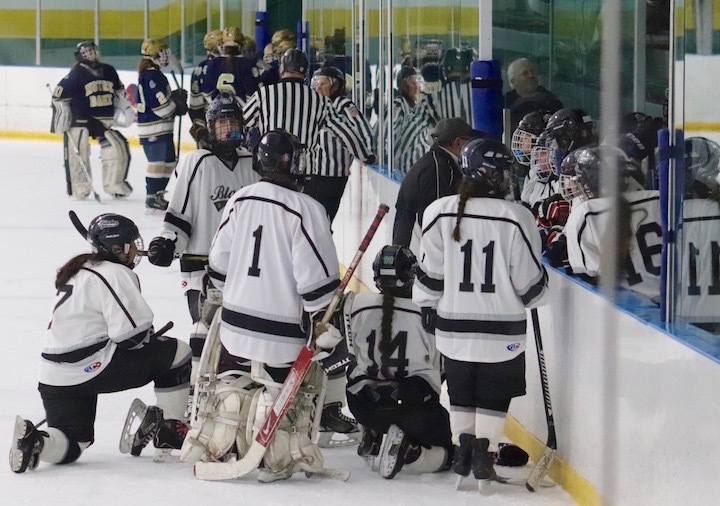 The Amity/North Haven/Cheshire Girls’ Ice Hockey Team (Blades) hosted Northwest Catholic/Mercy at the Rinks in Shelton on Jan. 3 at 6:30 p.m.
From the moment they skated onto the ice, the Blades showed their opponents that they were a force to be reckoned with. 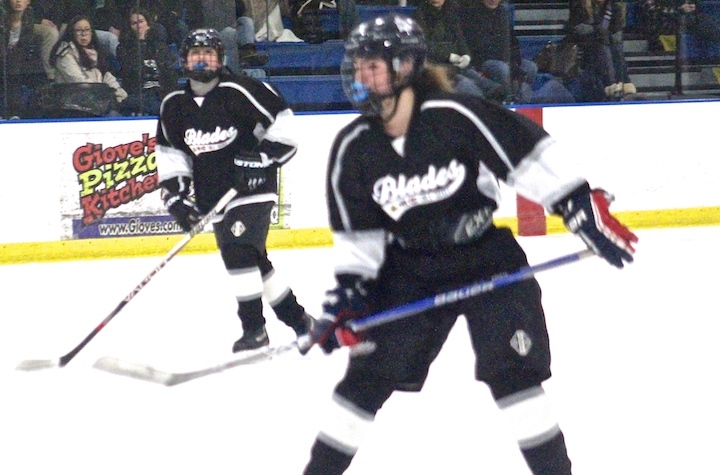 Tess Csejka (Amity #2) had three goals and two assists for the Blades, followed by Megan Spring (#23) with two goals. Csejka made the first goal of the game assisted by Melissa Montesi (#25) at 1:16 in the first period. The Blades continued to batter their opponents. Early on, Megan Spring made an unassisted goal at 12:20. Next, Meghan Hogan (#22) made her own unassisted goal at 8:34 and about 1.5 minutes later at 7:04, Cally Dixon (#17) smacked one in, assisted by Csejka and Montesi. Just seconds into the final period, Tess Csejka made an unassisted goal, bringing the score to 5-0. At 11:42, Nadia DiNatale (#11) made a goal assisted by Olivia Dittmann (#21) and Meghan Hogan (#22). Then, three minutes later, Shannon Reilly (#24) from Andrea DelVecchio (#3, Amity). 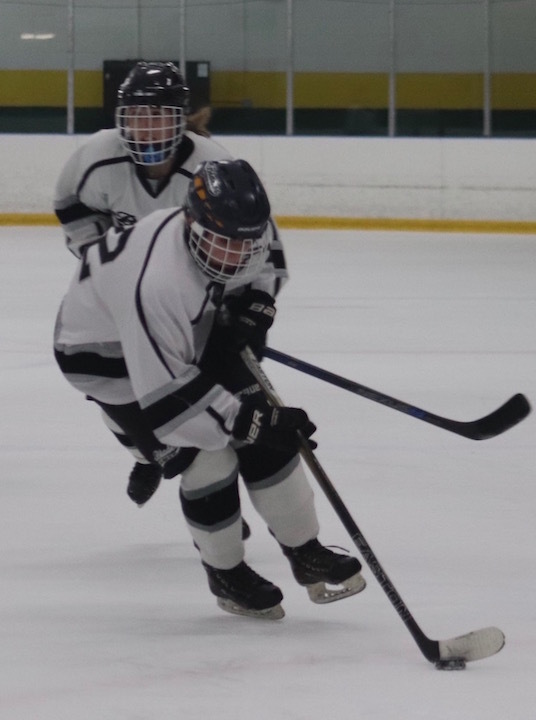 At 5:36, Tess Csejka (#2) scored her third goal on an assist from fellow Amity player Grace Kosh (#20), and with just 16 seconds left on the clock, Megan Spring made her second unassisted goal, wrapping up this nice 9-0 victory for the Blades. 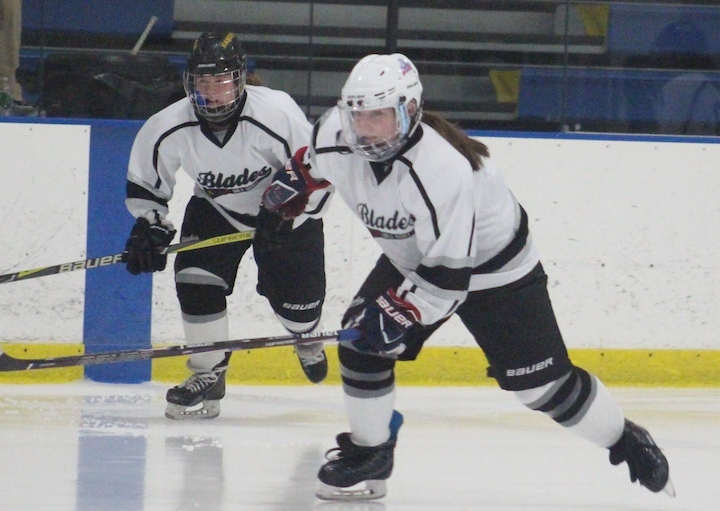 The Blades Girls Ice Hockey team hosted the Green Dragons of Hamden on Wednesday, Dec. 20 in Shelton. Both teams were 3-0 going into this matchup. Maggie Gould put Hamden on the scoreboard, assisted by Megan McKiernan at 9:13 in the first period. Six minutes later, Amity’s Tess Csejka, assisted by Melissa Montesi and Megan Spring, tied the game. 1-1. The second period saw a lot of action, but no advancement in the score. In the third period, just as it felt like the game may go into overtime, Reilly Sargolini got one past the Blades goalie, Juliana Daddio, on an assist from Demer Carangelo. Winning the game 2-1, with just 1:45 remaining. The Green Dragons outshot the Blades 29-16. Hamden’s Gianna Spino made 15 saves, Daddio made 27 saves for the Blades.